Abstract. Atmospheric pollutants have both beneficial and detrimental effects on carbon uptake by land ecosystems. Surface ozone (O3) damages leaf photosynthesis by oxidizing plant cells, while aerosols promote carbon uptake by increasing diffuse radiation and exert additional influences through concomitant perturbations to meteorology and hydrology. China is currently the world's largest emitter of both carbon dioxide and short-lived air pollutants. The land ecosystems of China are estimated to provide a carbon sink, but it remains unclear whether air pollution acts to inhibit or promote carbon uptake. 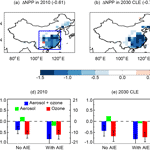 Here, we employ Earth system modeling and multiple measurement datasets to assess the separate and combined effects of anthropogenic O3 and aerosol pollution on net primary productivity (NPP) in China. In the present day, O3 reduces annual NPP by 0.6PgC (14%) with a range from 0.4PgC (low O3 sensitivity) to 0.8PgC (high O3 sensitivity). In contrast, aerosol direct effects increase NPP by 0.2PgC (5%) through the combination of diffuse radiation fertilization, reduced canopy temperatures, and reduced evaporation leading to higher soil moisture. Consequently, the net effects of O3 and aerosols decrease NPP by 0.4PgC (9%) with a range from 0.2PgC (low O3 sensitivity) to 0.6PgC (high O3 sensitivity). However, precipitation inhibition from combined aerosol direct and indirect effects reduces annual NPP by 0.2PgC (4%), leading to a net air pollution suppression of 0.8PgC (16%) with a range from 0.6PgC (low O3 sensitivity) to 1.0PgC (high O3 sensitivity). Our results reveal strong dampening effects of air pollution on the land carbon uptake in China today. Following the current legislation emission scenario, this suppression will be further increased by the year 2030, mainly due to a continuing increase in surface O3. However, the maximum technically feasible reduction scenario could drastically relieve the current level of NPP damage by 70% in 2030, offering protection of this critical ecosystem service and the mitigation of long-term global warming. 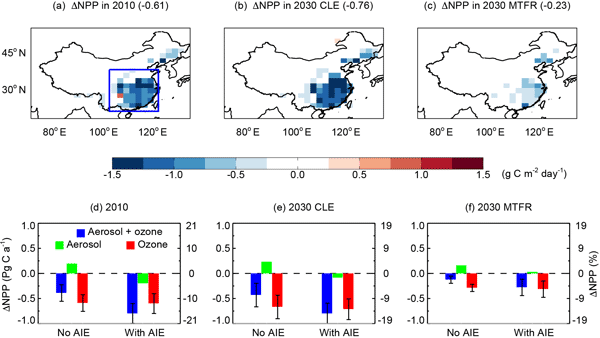 How to cite: Yue, X., Unger, N., Harper, K., Xia, X., Liao, H., Zhu, T., Xiao, J., Feng, Z., and Li, J.: Ozone and haze pollution weakens net primary productivity in China, Atmos. Chem. Phys., 17, 6073-6089, https://doi.org/10.5194/acp-17-6073-2017, 2017.